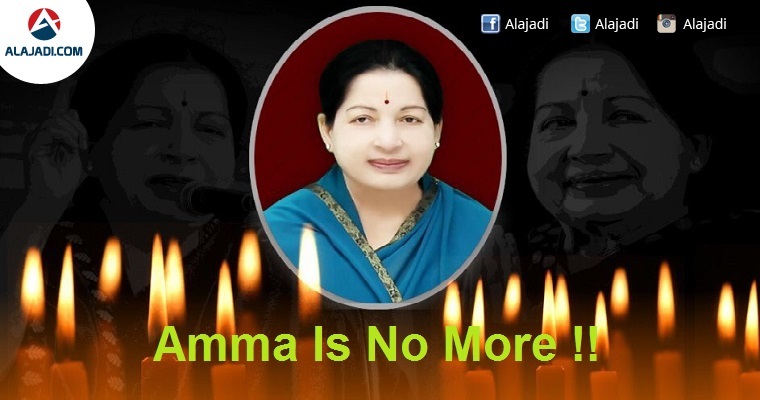 » Tamil Nadu Chief Minister J Jayalalithaa is no more ! Tamil Nadu Chief Minister J Jayalalithaa is no more ! Tamil Nadu Chief Minister J Jayalalithaa, a popular leader who showered the poor with populist programmes and a pole in state politics for three decades, died last night at a private hospital after battling for life for the 75 days. Our honourable Tamil Nandu Chief Minister Selvi J Jayalalithaa was admitted on 22.9.2016 with complaints of fever and dehydration and underlying co-morbidities. The honourable Chief Minister responded well to the multi-disciplinary care in the Critical Care Unit and subsequently recovered substantially to being able to take food orally. 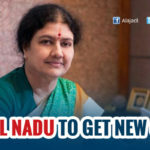 On this basis, honourable Chief Minister was shifted from the Advanced Critical Care Unit to the High Dependency Unit, where her health and vitals continued to improve under the close monitoring by our expert panel of specialists. After many tense hours following initial reports that Tamil Nadu Chief Minister J Jayalithaa had passed away, Apoll Hospital confirmed that the AIADMK supremo had breathed her last at 11.30 pm. 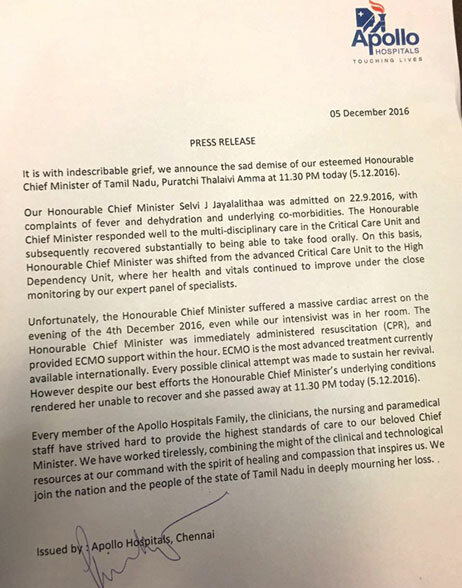 Earlier, the hospital denied media reports that Jayalalithaa passed away on Monday evening, saying that doctors from both AIIMS and Apollo continue provide her with life-saving measures. Dismissing the reports as totally baseless and false, Apollo asked news channels to rectify their mistake. Confusion gripped Tamil Nadu as news of Jayalalithaa’s death was flashed by Tamil news channels and picked up by the national media. Soon, a scuffle broke out between AIADMK supporters and police with the former throwing stones and upturning barricades outside Apollo Hospitals in Chennai. Police, deployed in large numbers to preempt any untoward incident, were forced to resort to lathicharge. 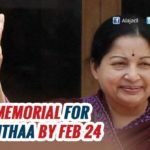 Even the party flag was seen flying at half mast at the AIADMK headquarters in Royapettah after the reports of her death, but it was hoisted once again after the hospital issued a denial. 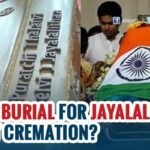 Tamil Nadu CM J Jayalalithaa’s mortal remains were kept at Rajaji Hall in Omandurar Estate on Anna Salai on Tuesday morning for public viewing. Initially, Jayalalithaa’s body was taken to her Poes Garden residence first. There after, She was moved to the Rajaji Hall. Amma was draped in her favorite green color saree. Army Personnel covered the casket carrying the body of 6-Time CM with Tri-Colour. Jaya’s close aide Sasikala Natarajan remained by her side. Jayalalithaa’s funeral will happen at the Dr MGR Memorial site on Marina Beach at 4.30 PM Today. After Jayalalithaa passed away, Tamil Nadu Government announced 7-day State Mourning from Tuesday. The national flag on the government buildings will be flown at half-mast during this period. There will be no official entertainment for the next one week. 3-Day holidays has been granted for all the educational institutions in the state. Even Puducherry Government announce 1-day holiday for all Government Offices and Educational Institutions as a mark of respect to Amma.